Also known as rhinorrhea, runny nose is a common symptom that occurs because of allergies, infections (such as cold or flu), physical irritation, and even inflammation. 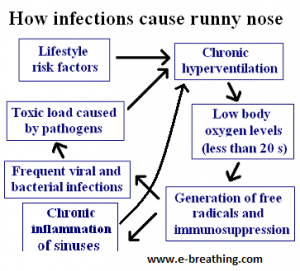 One of the most common causes of a runny nose is inflammation of the nose, which is also known as rhinitis. However, other common causes are inclusive of the common cold (upper respiratory infection), sinusitis (infection or inflammation of the sinuses), and influenza (flu). A running nose is typically accompanied by itching, redness and/or sneezing. If truth be told, a runny nose tends to occur only at times when one’s body and brain oxygen levels drop down below the medical norm. 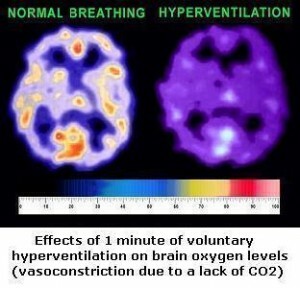 People these days commonly have less than 20 seconds for the body-O2 test, wherein low cell oxygen levels are typically triggered by chronic hyperventilation (breathing excessive amounts of air), upper chest breathing (which has the potential to significantly reduce blood oxygenation), and habitual mouth breathing. For some people, even allergic reactions have the potential to trigger a running nose. This particularly holds true in cases of allergic rhinitis or hay fever. In extremely rare cases, a runny nose can also be a symptom of a serious head injury that is caused by some sort of trauma to the brain. The excessive utilization of nasal sprays, particularly decongestants can also lead to a runny nose. Certain foods, including spices and other irritants can also lead to this condition. It is also possible for nasal congestion or a stuffy nose to accompany a runny nose. 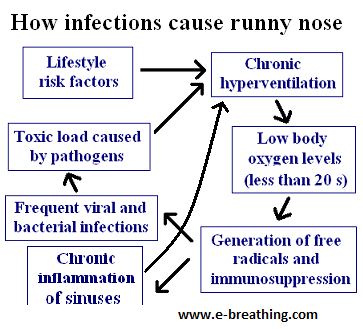 The most common superficial causes of a runny nose are inclusive of: 1. Bacterial and viral infections 2. Sleep 3. Meals 4. Stress 5. Emotions etc. However, the key factor almost always happens to be low body-oxygen content on a cell level. Whenever infections cause nasal congestion, the person suffering from this condition will have yellow or green colored mucus. This goes on to indicate that dead bacteria and/or viruses are present in the mucosal discharge. 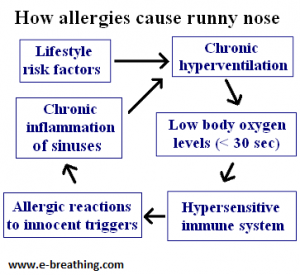 Allergies or allergic reactions to certain airborne substances can also cause a runny nose. These are inclusive of dust, dust mites, smoke, perfumes, proteins due to cats or dogs, tree pollen etc. In such a case, the main issue happens to be the hypersensitive state of the immune system, which is typically caused by chronic hyperventilation, or breathing more than the medical norm. Eventually, the cause happens to be the same, although the mucus will be clear in this case. Another major reason as to why one might produce a substantial amount of clear mucus are dairy products. All of these allergic reactions are typically caused by either lactose (milk sugar) or casein (the main protein found in milk). If allergic reactions have caused your runny nose, it is necessary for you to identify and avoid them from now on. For instance, it is easily possible for you to test out your bodily reactions towards dairy products by temporarily eliminating all dairy products from your diet for about 3-4 days. Those who are allergic to cat or dog proteins or tree pollen must make sure that they avoid these airborne triggers. As soon as you achieve more than 30 s for the body oxygen test, a majority of these substances (including dust, tree pollen, dust mites, cat proteins, dog proteins etc.) will not have the potential to produce an allergic or auto-immune response because of partial normalization of the immune system. On the other hand, hay fever may require you to achieve more than 30 seconds for the body-oxygen test, and you would also need to avoid all triggers for gradual desensitization of the immune system. Nearly 90% of people who suffer from a stuffy or congested nose can easily acquire natural, quick and easy relief in terms of their nasal breathing in just about 1-2 minutes. This can be done by simple slowing down their heavy breathing, and increasing body oxygenation with a simple breathing exercise. It was more than 180 Soviet and Russian medical doctors who practiced the Buteyko method who invented and used this easy respiratory exercise to clear a runny nose. This most natural remedy was taught by them to 1000’s of their patients who suffered from sinusitis, asthma, rhinitis, cystic fibrosis, chronic mouth breathing, hay fever etc. pregnant women and children may use it too. You can apply it while sleeping at night as well. You can easily achieve more than 20 seconds for the body-oxygen test by slowing down your basal or automatic breathing patterns, and get closer to the medical norm for breathing at rest. Once done, the upper-respiratory infections that you suffer from frequently will literally vanish. This is the permanent solution for a runny nose that is caused by infections.